This morning around 8:30 I saw what looked like a major police operation aimed at motorcycles. It was on Vibhavadi, left side going to Don Muang, just after Energy Building. Tens, maybe hundreds of young people were seated on the side of the road guarded by police. Big number of motorcycles parked on the side of the road at the same spot. And police officers between each lane controlling the traffic. Are they finally getting serious controlling these freaks on wheels ? Don't forget that motorcycles are involved in more than 70% of road accident in Thailand. I seem to be noticing more stops around the joint lately. Can't be a bad thing huh. I think it was tea money time. The kids organized a rally in defiance of the police on social media. Trying to crack down on the little shits. Waste of time really. Parents aren't going to care as long as the consequences are little to none. Unless you ride a bike. If only they had more brain cells than nasal sticks. Do they keep checking people for drug there also ? I saw them sometimes with their truck. 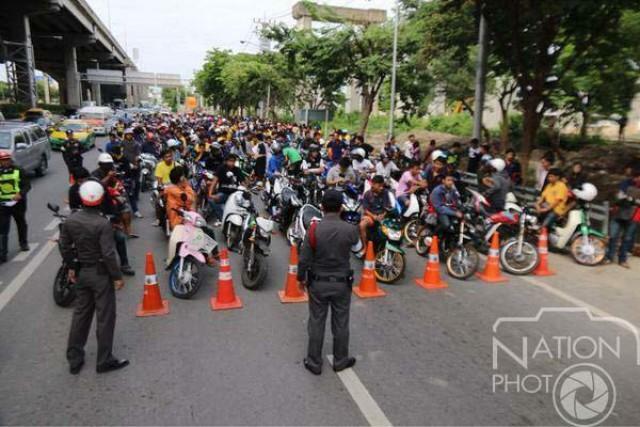 Metropolitan and provincial police today rounded up several hundreds of young motorcyclists as they mustered at several locations in Bangkok and adjacent provinces to drive to Nakhon Nayok's Wang Takrai waterfall. Assistant commissioner of the Royal Thai Police Pol Lt Gen Prawut Thavornsiri said Sunday that these young motorcyclists claimed they were planning to Wang Trakrai for visit but they intended to race along the way from Bangkok to Nakhon Nayok in defiance of the law. They drove on the Vibhavadi Rangsit in large number abreast of all lanes, even on inbound lanes with no fear of the law and with no regard to the safety of other road users, he said. More than a hundred of them were rounded up at Bang Khen intersection in front of Bang Khen railway station. Pol Lt Gen Prawut said these defiant racers started mustering at various places in the capital at 5 am, awaiting the police to lift their routine road checkpoints before starting the long journey to Nakhon Nayok in large groups. He said by noon today the police were still taking them and transporting their vehicles on trucks to the station. “It’s really a waste of time to deal with these young racers, as the police still have other important things to do,’” he said. He also said they and their parents could face charges if their motorcycles were found to be modified for racing, for driving with no licence. Initially these youngsters will face charge for driving with no regard to the safety of others, he added. Earlier in the morning their presences on several locations in the capital and on major highway which include Vibhavadi Rangsit and Rangsit Nakhon Nayok roads turned traffic on these roads to chaos. Hundreds of these young motorcyclists, under 18 years old, were intercepted and have all their vehicles checked as well as their driving licences. The police later exercised power under Article 44 to confiscate all their motorcycles for check. If they are found to be modified for racing they will be seized, and their parents will also face charges under the order earlier announced by the military junta. Most of these teenagers did not wear crash helmets and they drove in large groups of 50-100 abreast of the roads, and some also in the reversible lanes ignoring traffic law. But several hundreds of these teenagers were able to avoid police road blocks and were making their way to Wang Trakrai waterfall. Meanwhile Prachinburi police were also trying to intercept hundreds of young street racers as they blocked all traffic lanes to race along a section of the road from Prachinburi to Nakhon Nayok. Motorists have to stop to let these youngsters to race.